If you were lucky enough to go to QuiltCon East in Savannah, GA in February, you may have seen the Gem Bag at the Hoffman Fabric Me+You exhibit. Little needs to be said about this stunning tote. Jaw dropping will do. I want to show you the up-close details and basics so you can make one for yourself. Me+You Indah Hand Dyed Batiks, precut 2.5-inch strips from Hoffman California Fabrics. Plus you'll need fabric for lining, side panels and straps. - Normal sewing supplies including a cutting mat, acrylic ruler, rotary cutter, thread, etc. Audition fabric to decide how you want your Gem Bag to look. 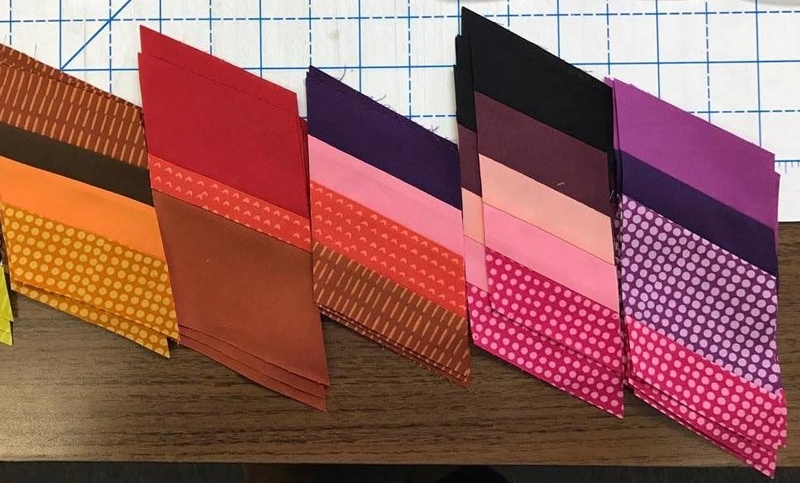 You will use about half of the pre-cuts and have fabric left over. You might think about making a second bag with the extras. - Cut strips in half to 22” in length, then cut into differing widths from 1, 1 ¼” or 2”, leaving a few strips at 2½ inch width. - Sew 4-5 strips into strata with fabrics that are similar. Strata are pressed and cut at a 60-degree angle and then cut into 3” pieces. The strata become like a color pallet. Below are the strata pieces laid on the interfacing template. Move the strata sections around to suit yourself. There is no wrong way to do it. Next, take the strata sections off one row at a time, and sew them end to end. Replace them back onto the same template row. Did you notice the little thin lines that pop up on some rows? Those are added when the colors need a visual boost. You add 1 to 1½ inch strips to the section you want, then trim the piece back to 3” wide, before the next step. When you’ve sewn all the rows together, you glue baste them to the template with water soluble glue. Next, strips are sewn to the template by folding along the diagonal lines and stitching on the back in the ¼" seam allowance. The pattern gives complete detail on how to do this. You are almost done with the top at this point. The template is pictured below. Once the top is done, you make the quilting “sandwich” of the Dancing Diamonds Top, then Flex Foam and PelTex, and lastly, the lining, and then quilt as desired. Flex Foam plus Pel Tex will give the bag a very stiff, durable feel. For finishing the side panels, adding binding and grommets, and making the strap, the details are in the pattern. We like the straps on this one with ¼″ cording wrapped with bias strips of the Indah hand-dyed black batik, and then it is zigzagged with black thread. The cord is continuous and when it meets, Bethany zigzagged the ends together, wrapped them and stitched again. The wrapped cord also pulls the bag closed when it’s lifted. The side panels consist of the outer fabric, Flex Foam and a fabric to match the lining, and are then quilted. The sewing level for this bag is Confident Beginner to Intermediate. In making this bag you will learn skills that will help you in other projects. I’ve learned that we are all looking for a project to enjoy making and love using. Finding the right fabric and design makes sewing a joy! We believe the creativity of sewing is a gift from our Creator to bless us in a most practical way with things we need, use and wear. We hope you’ll stop by plumeasypatterns.com and check out all our patterns.